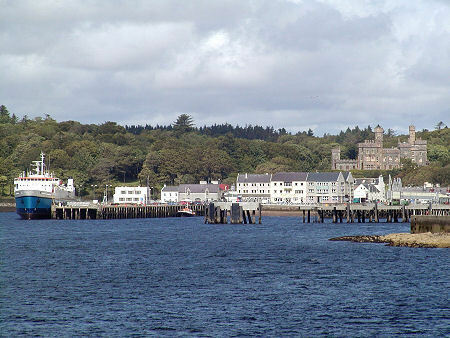 The name of Stornoway comes from the Norse for "Steering Bay", an indication of the very early origins of the town. 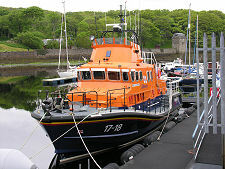 As the best natural harbour in the Western Isles it was an obvious focus for development, and Stornoway Castle was built as early as 1100 by the MacNicol family. The castle was later captured by a Viking called Leod, who founded the dynasty that later became the MacLeods of Lewis. Clan disputes flared through the 1500s and the MacLeods remained a thorn in the side of the Edinburgh government. In 1597 James VI adopted a new approach to resolving the problems posed by his Gaelic-speaking subjects. He leased Lewis to a group of lowland businessmen called the "Fife Adventurers" and authorised them to use all means necessary, including what would today be called genocide, to "root out the barbarous inhabitants". The Fife Adventurers were beaten off by the the MacLeods, and finally gave up after a third attempt in 1608. In response, James VI withdrew the MacLeod's charter in 1610 and granted Lewis to the MacKenzies of Kintail, who ran their estates from afar. Stornoway Castle was destroyed by Cromwell's forces in 1653 and the last remains of it removed in the 1800s to provide foundations for a pier. 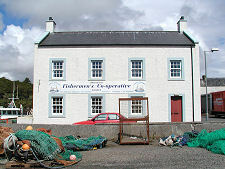 Its site lies somewhere near the ferry terminal. 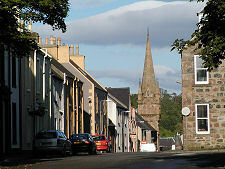 From 1661, Lewis became part of Ross-shire and was administered from distant Dingwall, an arrangement that was to last until the creation of the Western Isles Council in 1975. 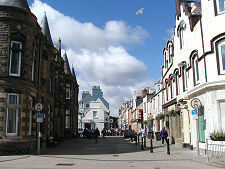 Stornoway grew through the 1700s, with some fifty slated buildings existing in the town by 1789. 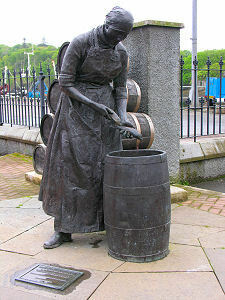 The 1800s saw the town take advantage of the herring boom, with as many as 6,000 fishermen operating from the port during its peak, supported by large numbers of gutters and packers. In 1844 Lewis was sold by the MacKenzies to Sir James Matheson for £190,000. Matheson found an island containing just one wheeled vehicle, and set to work building roads, training islanders, establishing a daily mail service from Portree and Lochinver: and building Lews Castle on a site overlooking the harbour. 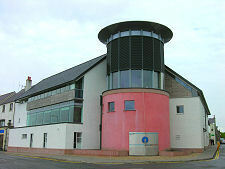 After a period of disuse, Lews Castle now serves as a museum and archive for the Isle of Lewis. The Mathesons in turn sold Lewis to Lord Leverhume in 1918, who spent some time and a lot of money trying to redevelop the island on a grand scale before giving up and turning his attentions instead to Harris. Stornoway's transport links improved with the establishment in the 1850s of steamer services to Glasgow via Portree and to Oban, and in 1894 there was a daily steamer from the railhead at Strome Ferry, plus less frequent links to Stromness and Liverpool. But while the sea lay behind Stornoway's growth it also led to its most tragic moment, on 1 January 1919. The ship Iolaire was wrecked while entering the harbour and 205 Lewismen returning home after surviving the war were drowned within sight of home. The scale of the tragedy can be appreciated when the number who died is compared with the 1,000 islanders killed during the First World War itself. 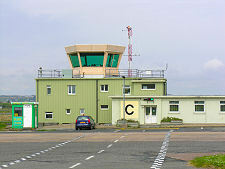 In 1934 air services started to Renfrew and Inverness, and during world War Two the RAF built what is now Stornoway Airport, just to the east of the town. 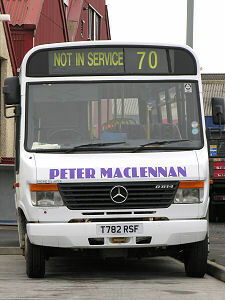 Today it continues to provide links to Glasgow and Inverness, as well as with Benbecula. Transport by sea has also improved. 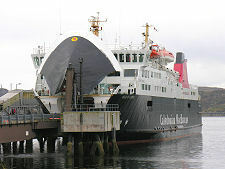 Car ferries replaced steamers from 1973, the start of the service that now links Stornoway with Ullapool. 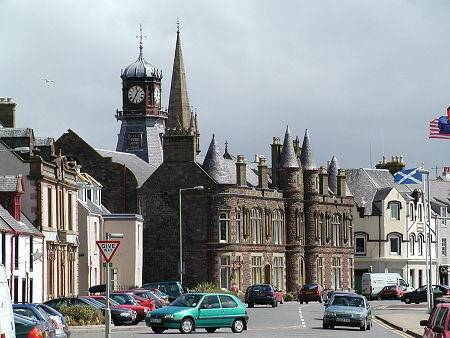 Today's Stornoway is by far the largest settlement in the Western Isles, a bustling and attractive town. 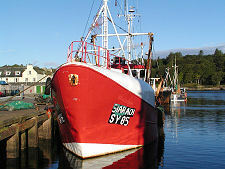 The harbour remains busy with freight, ferry and leisure traffic, and home to a significant fishing fleet. The shape of the town is defined by the harbour, which partially surrounds it. 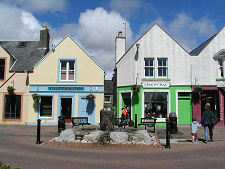 A number of the streets in the centre are pedestrianised, providing good access to an interesting range of shops pleasantly different from the usual outlets colonising most UK High Streets. Visitors to Stornoway should be aware that Sunday observance remains strong here. Transport links to Lewis and Harris, are now more readily available on a Sunday than they used to be. But many shops, petrol stations, cafes, pubs, and visitor attractions are closed on Sundays. Sunday observance is part of the culture of Lewis and Harris, and part of what makes them unique. However, given the difficulty in accessing services on a Sunday, our advice would be to ensure you know exactly how your food, drink, transport and accommodation is going to be provided in advance if your stay includes a Sunday.